HARLEQUINS became the second side, and the only English team, in the semi-finals of this year’s Amlin Challenge Cup with their 32-22 victory over London Wasps at the Stoop, writes Rugby World editor Paul Morgan. The win in this cracking match keeps Harlequins’ season alive although they will have to improve hugely if they are to win in Munster or Brive in the next round! They won the game through the boot of Nick Evans, who kicked five successive penalties and a drop goal in a 22-point haul when Wasps got back into the match. They raced into a 14-0 lead inside the first six minutes and there was realistically only one winner after a start like that. The game was typical of the clashes between these sides – free flowing, entertaining and high octane. More of this in the Aviva Premiership please! The reality for Wasps is that their season is now over as even if they win their final three games and pick up 12 points they will almost certainly not make the top six and earn Heineken Cup rugby for next season. That is a sad state of affairs for a once proud club. But as they have failed to replace the succession of world-class players who have left the club since 2008 it may be a long way back. Wasps had enough ball against the Quins to win this game but failed to convert their possession into points, committing a series of unforced errors and handing far too many penalty chances to Nick Evans – the Kiwi took them all and Quins are through. 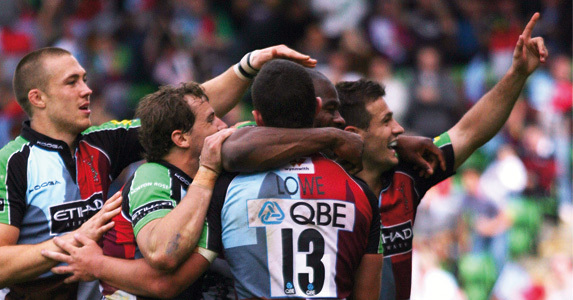 Nick Evans – If there is one player that Graham Henry should break his home-rule for it’s the Harlequins outside-half. The All Blacks have no established back-up for Dan Carter and although they have committed to only picking players who are in the Super 15 they should make an exception for the World Cup. Evans is just the sort of experienced player you need coming on in the final quarter of a tight knockout game at the World Cup. In this game Wasps clawed their way back into the game but five successive penalties and a drop goal from Evans killed the game. Maurice Fa’asavalu – Made a big impact at the 2003 World Cup and is now back in union and building a fearsome reputation. The bad news for Wales is that he continues to improve and could put some steel into the Samoan pack at the World Cup. A real find by Conor O’Shea. Riki Flutey – Martin Johnson will be sleeping a little easier tonight as Flutey had his best game since the 2009 Lions tour and proved with intense summer preparation he could be England’s inside centre for the World Cup. 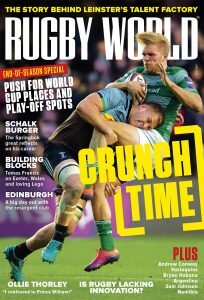 Tom Lindsay – Continues to build an impressive reputation in the middle of the Wasps front row. We all know how good he is around the field but he is now improving his lineout skills as well. If he continues to improve at this rate it will be when not if he plays for England. An outside bet for the Churchill Cup in June. Serge Betsen – Can someone please explain to Serge that he shouldn’t retire at the end of the season. He’s playing too well to go anywhere. Simon Shaw – English rugby’s strong man, Shaw turned in a whale of a game at the Stoop and proved he too can regain his England place, alongside Flutey. Harlequins: Brown; Camacho, Lowe, Turner-Hall, Monye; Evans, Care; Jones, Gray, Andress; Kohn, Robson; Fa’asavalu, Skinner, Easter (capt). Replacements: Brooker for Gray (48 and Gray for Brooker, 67), Lambert for Andress (52), Vallejos for Kohn (56), Browne for Robson (78). Not Used: Johnston, Moore, Clegg, William. Wasps: Van Gisbergen; Haughton, Jacobs, Flutey, Lemi; Walder, Simpson; Payne, Webber, Broster; Shaw, Launchbury; Betsen, Ward-Smith, Powell. Replacements: Wade for Lemi (21), Lindsay for Webber (32), Taulafo for Broster (60), Jones for Betsen (67). Not Used: Beech, Cannon, Davies, Mayhew.